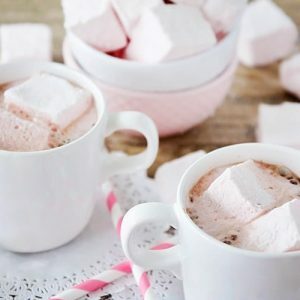 These gorgeous pink homemade strawberry marshmallows are surprisingly easy to make, and perfect for s'mores, hot chocolate, and Valentine treats! Prepare a 9 x 9 baking dish by lining with plastic wrap and dusting thoroughly with powdered sugar. Blend the strawberries in a food processor or blender until smooth. Pour the strawberry mixture into the bowl of a stand mixer, and sprinkle with the gelatin. Mix with a fork until blended. In a medium saucepan, whisk together the corn syrup, sugar, salt, and water. Heat, stirring frequently, until the mixture reads 240 degrees on a candy thermometer, then remove from heat. Turn the mixer on low speed, with the whisk attachment. Carefully and slowly pour the hot sugar mixture down the side of the bowl into the strawberry and gelatin mixture. When all of the sugar mixture has been added, increase the speed to high and beat 10-12 minutes, or until the mixture is a light shiny pink color and just slightly warm to the touch. Add the vanilla during the last few minutes of beating time. Scoop the marshmallow mixture into the prepared pan and spread evenly using a spatula sprayed with cooking spray. Sprinkle with powdered sugar and let stand for at least 4 hours. Cut into cubes and toss in powdered sugar to coat all the sticky parts. Store in an airtight container.